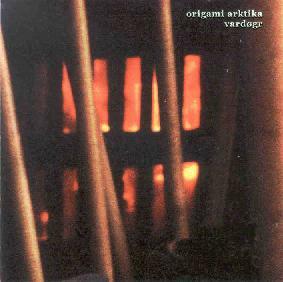 Origami Arktika consist of Kai S. Mikalsen, Kjell Oyvind Braaten, Bjarne Larsen, Rune Flatten and Tore H. Boe. They come from Norway and their bio describes the music as a hybrid of traditional Scandinavian folk and textural ambient noise, celebrating life, friendship, and heritage. Vardogr is an Old Norse word, meaning a forewarning, almost an omen. Just a tad of info for the curious out there. The CD lasts around the 40-minute mark and it has a definite traditional feel to it. The tracks are very mellow and slow in tempo. There is a lot strange sound experimentation going on throughout the album and several pieces have that Pink Floyd 'Saucerful of Secrets' noise going on. 'Ny Stein' is one such track, The majority of this 4.22 minute piece is guitar gliss and cymbal work as well as other obscure sound creation. 'Eltavaag' on the other hand is a very mellow acoustic guitar track. It has an element of the strange as well and the background sound is quite haunting. There is a lot of percussion on here as well, and that also reoccurs throughout the CD. Origami Arktika use what sounds like an array of different instruments. They range from bowed instruments to things that you beat with sticks. From things that you pluck to things that you do not pluck. They are all in there doing their bit. I can definitely hear things being dropped on to the floor on the track 'Trank:vill'. This piece is crazed and is very much in the mould of the aforementioned Pink Floyd vein as well as element of Jorge Reyes's ambient noise stuff. Just beware if listening through headphones because 'Trank:vill' has some deafening moments when some sort of drum is being pounded mercilessly. Very strange and very Pink Floyd. Origami Arktika show on Vardogr that they are more into the noise elements rather than the music elements. There is a couple of songs on here that have singing and there are a few acoustic things but that is it. The rest is just noise. I found it interesting but nothing ground breaking.